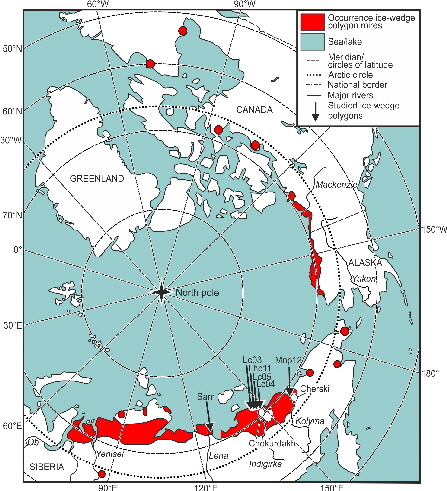 Ice-wedge polygons occur in areas with continuous permafrost. Frost-cracks in the soil are responsible for the formation of polygonal patterns, whereas the growth of ice-wedges along these cracks - after sufficient time - result in the formation of low ridges enclosing central depression. Surface water runoff during the short Arctic summers is severely hindered by these ridges, whereas subterranean drainage is prevented by the shallow depth of the frost table. These factors provide an environment ideal for peat formation, which is additionally favoured by the slow decay of organic material during the long cold winters. 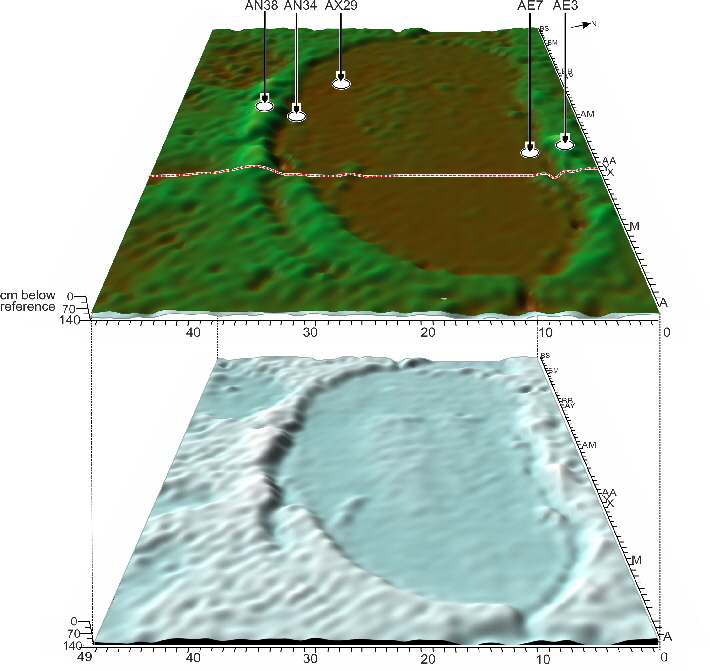 Ice-wedge polygons in which peat formation takes place are polygon mires. Whereas the “normal” polygons are low-centered, i.e. small ridges enclosing a central depression, degraded forms may show high-centers after ice-wedges have collapsed and a resulting relief-inversion. 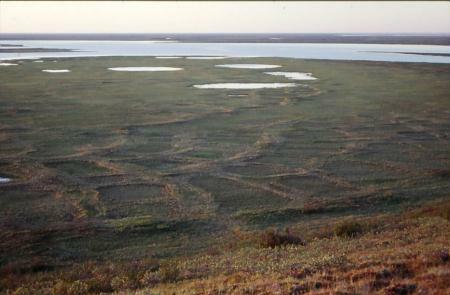 Several ice-wedge polygon mires in NE Yaktua (NE Siberia) are or have been subject to intensive actuo- and palaeoecological studies, located on Samoylov Island (Lena Delta), in the region around Chokurdakh and the research station Kytalyk (Indigirka Lowlands), and in the area of Pokhodsk near Cherski (Kolyma Lowlands). Actuo-ecological studies include the mapping of vegetation in every square meter of the polygons, as well as mapping of abiotic parameter such as ground-surface height, top of the frozen soil, pH, C/N etc. Furthermore, surface palynological samples along transects through the polygons aim to get insight in the relation between microtopography, actual vegetation and pollen dispersal, which facilitate palaeoecological studies of peat profiles. Palaeo-ecological studies are carried-out on closely-spaced peat sections in order to study the short-distance variation in peat formation. These studies include analysis of pollen, macrofossis, testate amoebae and geochemistry. To study the relation between pollen deposition and actual vegetation (mapped for each plot of 1 m2) palynological surface samples were analysed along transects through the studied polygons Lc04 (Chokurdakh), Lhc11 (Kytalyk), Mnp12 (Pokhodsk) and Sam (Samoylov Island) with distances of 1 m. The range of enlarged pollen deposition (local and extralocal pollen deposition trajectory) is restricted to only 1 or 2 metres which is attributed to the generally low growth forms of the flora (not exceeding 20 cm). There is a clear connection between vegetation patterns, pollen deposition and microtopography, which shows that palynological studies of peat profile enable the detection of previous dry or wet phases, i.e. the existence of a ridge or a depression/trough. High pollen/spore deposition of the most important plant taxa (Salix, Betula, Ericales, Cyperaceae, Comarum, Rubus, Sphagnum) normally occurs at only few plots. This means that only one or few specimens of the total population obtain optimal flowering or pollen production. This illustrates the complex relationship between plants, flowers and flowering, and pollen production, pollen dispersal and pollen depositions. Non-pollen-palynomorphs show a good relation with surface elevation. The testate amoebae Assulina, Amphitrema and Arcella occur at the higher polygon ridges, whereas algae of the Zygnemataceae family occur in the moist polygon centre and in a deep throughs. Since C/N-values are also closely related to the surface elevations, the distribution patterns of the testate amoebae might also relate to trophic conditions. 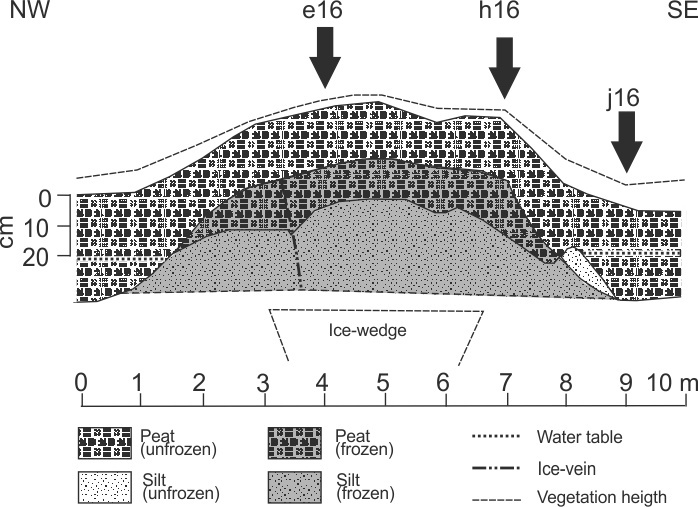 In order to study the vegetation history and ice-wedge polygon development, various peat sections were collected within the studied polygons at different polygon elements, i.e. ridges, centres, troughs, and at transitional sites between these elements. In the low-centred polygon Lc04 near Chokurdakh sections e16, h16, and j16 were taken along a 5 m long transect from the middle part of the northwestern polygon ridge to the moist polygon centre; section q9 originates from another polygon ridge in state of collaps. Radiocarbon dates show that the peat basis is ca. 1000 years old. With a sample resolution of 0.5 cm, a temporal resolution of ca. 20 years was reached. The analyses from section j16 show that the polygon centre has been continuously wet throughout the complete studied time-frame. This shows that relatively dry phases in the other cores can be interpreted as phases of dry polygon ridge formation. Sections e16 and h16 include two wet and two dry phases, which illustrate that after an initial wet phase a polygon ridge was formed, which subsequently collapsed, and then regenerated. Section q9 shows an almost continuous wet environment, with the exception of one ridge-phase. After collapse of this ridge, regeneration did not take place. A direct comparisson with (palaeo)-climatic data from NE Siberia shows that ridge formation occurred during relatively warm phases whereas collapse took place during colder phases. However, climate did not act directly on polygon ridge development, but indirectly by influencing precipitation, snow cover and meltwater input. These finds demonstrate clearly that - contrary to commonly thought - ice-wedge polygon mires are not almost completely static and stable systems, but that they are highly dynamic. This palaeoecological research strategy will also be applied for the Kytalyk and Pokhodsk polygons Lhc11 and MNP12, and the “transect 2” on Samoylov Island. In Lhc11, in total 7 peat sections have been taken along the transect j, covering the polygon centre, the polygon ridge and the trough. First analyses indicate that the polygon ridge migrated inwards from its original position, where now the trough is located. Pollen analyses of the 7 peat profiles show a pronounced change from wet to dry conditions that illustrate the formation and expansion of the eastern polygon ridge. The collapse of the ridge at j20.20 and j21.10 occurred rapidly relatively “recent”, and it is tempting to interpret a connection with mid/late 20th century climate warming, but this is not yet confirmed. Section j18.80 has been analysed on pollen, macrofossils, testate amoebae and geochemistry and show in great detail changes in hydrological conditions and is with 210 samples a profile with one of the highest resolutions from the complete Arctic (Teltewskoi et al. 2016). Polygon MNP12 seems to consist of a complex of 6-8 individual former polgyons with degraded ridges. 5 peat profiles have been excavated from strategically selected spots at and immediately adjacent to the outer rim, and in the centre of the complex. Location of “transect 2” on Samoylov Island crossing 11 adjacent low-centre ice-wedge polygons. On Samoylov Island, a transect of 11 adjacent polygons was investigated on surface height, water table and frost table (Minke & Kirschke 2007). Detailed vegetation relevees are available for a reach of 125 m across polygons 4-11, for which currently pollen samples (distance again 1 m) are under investigation. Three short peat profiles will be analysed for polygon 7 and the ridge separating polygons 6 and 7. 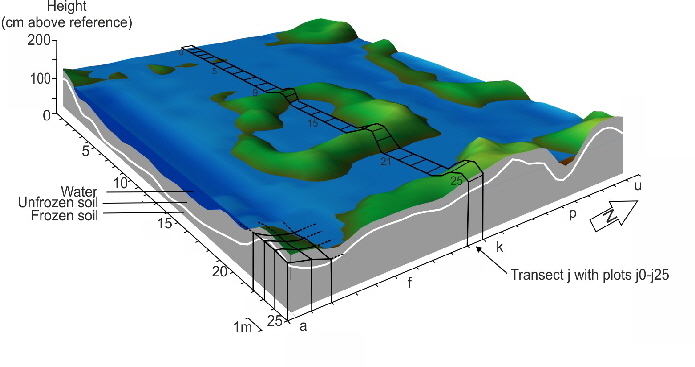 “Transect 2” on Samoylov Island crossing 11 adjacent low-centre ice-wedge polygons. Pollen surface samples are under investigation for polygons 4-11. Transect 2 on Samoylov Island with the line representing the reference level, view from the north with polygon 11 in the foreground (photo: Merten Minke). 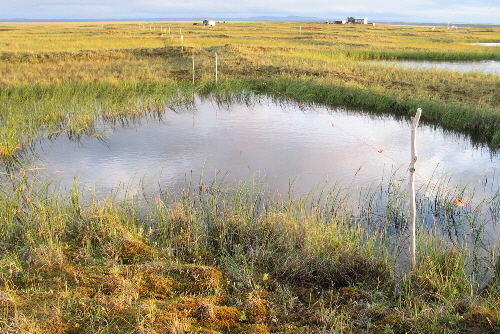 This research is carried out in close cooperation with Enrico Behrens, Norman Donner, Mariusz Gałka, Hans Joosten, Merten Minke, Vigdis Ratzbor, Annette Teltewskoi, and Martin Theuerkauf, and is part of the project “Polygons in tundra wetlands: state and dynamics under climate variability in polar regions (POLYGON)” financed by the German Research Counsil (DFG). Link to the poster High resolution palaeo-ecological studies of polygon mires in the Indigirka-Kolyma lowlands. Link to the poster Patterns in vegetation and pollen deposition along surface sample transects from four ice-wedge polygons (NE Siberia) Studied ice-wedge polygons. Link to the poster Development of ice-wedge polygons: examples from the Lena River Delta (N Russia). Link to Photographs of pollen grains of plants in NE Siberia. Beermann, F., Teltewskoi, A., Fiencke, C., Pfeiffer, E.-M. & Kutzbach, L. (2015): Stoichiometric analysis of nutrient availability (N, P, K) within soils of polygonal tundra. Biogeochemistry 122: 211-227. Behrens, E., de Klerk, P. & Joosten, H. (2016): Records from the collapsed polygon complex MNP12 for actuo- and palaeoecological studies. In: Schirrmeister, L., Pestryakova, L., Schneider, A. & Wetterich, S. (eds. ): Studies of polygons in Siberia and Svalbard. Berichte zur Polar- und Meeresforschung / Reports on Polar and Marine Research 697: 49-54. De Klerk, P., Donner, N., Joosten, H., Karpov, N.S., Minke, M., Seifert, N. & Theuerkauf, M. (2009. 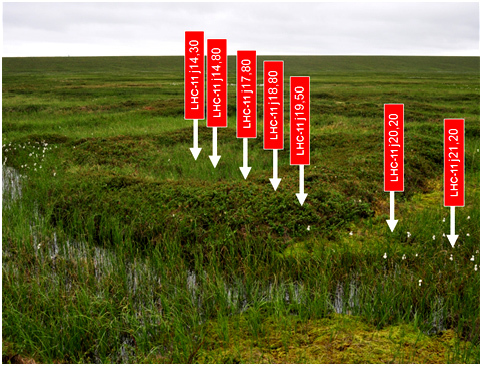 ): Vegetation patterns, recent pollen deposition and distribution of non-pollen palynomoprhs in a polygon mire near Chokurdakh (NE Yakutia, NE Siberia). Boreas 38: 39-58. De Klerk, P., Donner, N., Karpov, N.S., Minke, M. & Joosten, H. (2011): Short-term dynamics of a low-centred ice wedge polygon near Chokurdakh (NE Yakutia, NE Siberia) and climate change during the last ca. 1250 years. Quaternary Science Reviews 30: 3013-3031. De Klerk, P., Teltewskoi, A., Theuerkauf, M. & Joosten, H. (2014): Vegetation patterns, pollen deposition and distribution of non-pollen palynomorphs in an ice-wedge polygon near Kytalyk (NE Siberia), with some remarks on Arctic pollen morphology. Polar Biology 37: 1393-1412. De Klerk, P., Theuerkauf, M. & Joosten, H. (2017): Vegetation, recent pollen deposition, and distribution of some non-pollen palynomorphs in a degrading ice-wedge polygon mire complex near Pokhodsk (NE Siberia), including size-frequency analyses of pollen attributable to Betula. Review of Palaeobotany and Palynology 238: 122-143. De Klerk, P., Donner, N., Minke, M. & Joosten, H. (2018): Comprehending the arctic ice-wedge polygon mire landscape using short-distance high resolution palaeoecological research. In: Sychev, V.G. & Mueller, L. (eds): Novel methods and results of landscape research in Europe, Central Asia and Siberia. Volume 1: Landscapes in the 21th century: status analyses, basic processes and research concepts. Russian Academy of Sciences FSBSI “All-Russian research institute of Agrochemistry named after D.N. Pryanishnikov”: 257-262. doi: 10.25680/6112.2018.76.43.048257-262. Donner, N., Minke, M., de Klerk, P., Sofronov, R. & Joosten, H. (2012): Patterns in polygon mires in north-eastern Yakutia, Siberia: the role of vegetation and water. The Finnish Environment 38: 19-30. Minke, M. & Kirschke, S. (2007): Satellite images and ground measured reflectance spectra, thaw depth, soil moisture and vegetation type for characterizing permafrost regions. In: Boike, J., Bolshiyanov, D.Yu. & Grigoriev, M.N. (eds. ): Russian-German Cooperation SYSTEM LAPTEV SEA: The expedition LENA 2006. Berichte Zur Polar- und Meeresforschung / Reports on Polar and Marine Research 566: 17-21. Minke, M., Donner, N., Karpov, N.S., de Klerk, P. & Joosten, H. (2007): Distribution, diversity, development and dynamics of polygon mires: examples from Northeast Yakutia (Siberia). Peatlands International 2007(1): 36-40. Minke, M., Donner, N., Karpov, N.S., Seifert, N. & Joosten, H. (2007): A window to the soul: biotic/abiotic feedback mechanisms in polygon mire ecosystems. In: Influence of climatic and ecological changes on permafrost ecosystems. Proceedings of the third international conference "The role of permafrost ecosystems in global climate change". YSC Publishing House SB RAS, Yakutsk: 115-121. Minke, M., Donner, N., de Klerk, P., Karpov, N.S., Sofronov, R.R. & Joosten, H. (2008): Spatial and temporal variation in carbon accumulation in a Northeast Siberian arctic polygon mire over the last millennium. Geophysical Research Abstracts 10: EGU2008-A-07425. Minke, M., Donner, N., Karpov, N.S., de Klerk, P. & Joosten, H. (2009): Patterns in vegetation composition, surface height and thaw depth in polygon mires in the Yakutian Arctic (NE Siberia): a microtopographical characterization of the active layer. Permafrost and Periglacial Processes 20: 357-368. Teltewskoi A, Seyfert J, & Joosten, H. (2012): Records from the model polygon Lhc-11 for modern and palaeoecological studies. In: Schirrmeister, L., Pestryakova, L, Wetterich, S. & Tumskoy, V. (eds.) (2012): Joint Russian-German Polygon Project East Siberia 2011 - 2014: The expedition Kytalyk 2011. Berichte zur Polar- und Meeresforschung / Reports on Polar and Marine Research 653: 51-60. 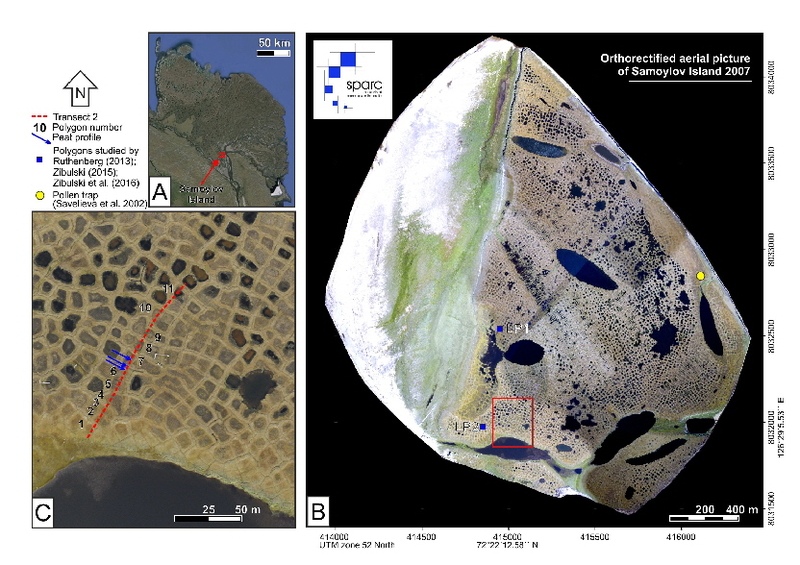 Teltewskoi, A., Beermann, F., Beil, I., Bobrov, A., de Klerk, P., Lorenz, S., Lüder, A., Michaelis, D. & Joosten, H. (2016): 4000 years of changing wetness in a permafrost polygon peatland (Kytalyk, NE Siberia): a comparative high-resolution multi-proxy study. Permafrost and Periglacial Processes 27: 76-95.